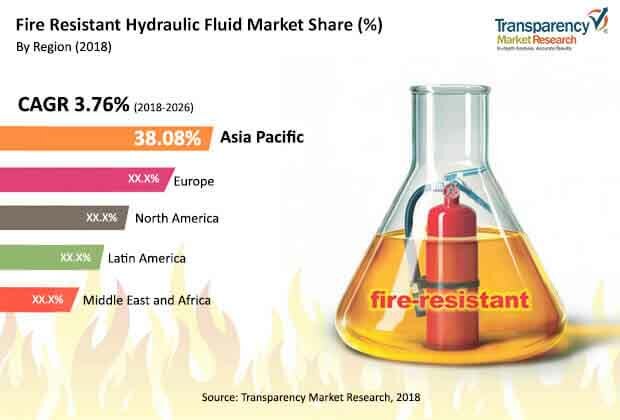 The global fire resistant hydraulic fluid market was valued at around US$ 1.2 Bn in 2017 and is anticipated to expand at a CAGR of nearly 4% from 2018 to 2026, according to a new report by Transparency Market Research (TMR) titled ‘Fire Resistant Hydraulic Fluid Market - Global Industry Analysis, Size, Share, Growth, Trends, and Forecast, 2017–2026.’ Fire resistant hydraulic fluids are hydraulic fluids with high fire resistance and much higher combustion temperatures vis-à-vis mineral oils. Mineral oils and petroleum-based hydraulic fluids are not used in applications where they can potentially come in contact with hot surfaces or open flames due to their high flammability. In such cases, fire resistant hydraulic fluids are preferred due to their inherently high fire resistance property. However, selection of the right fire resistant hydraulic fluid can often become a trade-off between hydraulic fluid performance characteristics and the system requirements in order to minimize costs and maximize health & safety benefits at the same time.